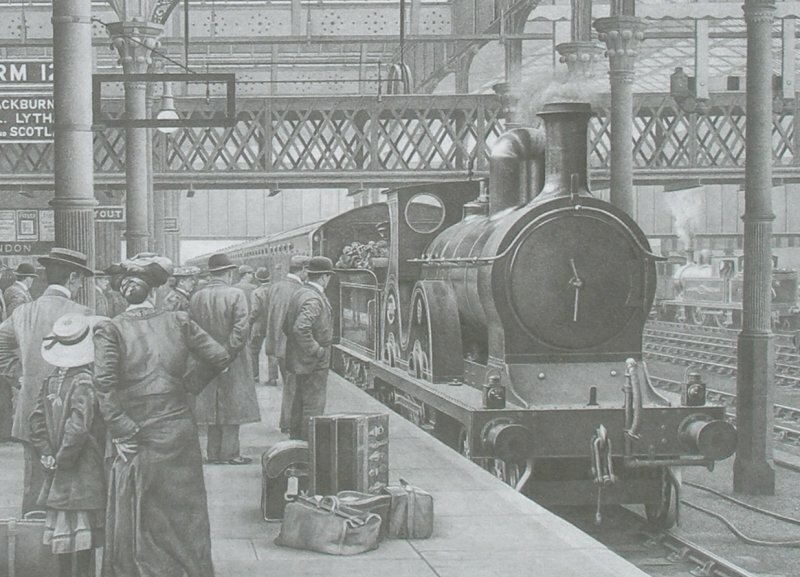 This is the fine print of a L&YR 4-4-0 waiting for the off in the old Manchester Victoria station which hangs in my office. John Gibb is the artist, and he is currently working on 'Hellifield'. There is a huge amount of detail in this sketch: all beautifully executed in pencil. Note there are three trains in view: the 4-4-0 will shortly be heading for the coast; Liverpool, Southport or Blackpool are all possible destinations. In the background an 0-6-0 steams up the middle road heading for Miles Platting, whilst in the background a 2-4-2 Radial tank simmers at the platform. 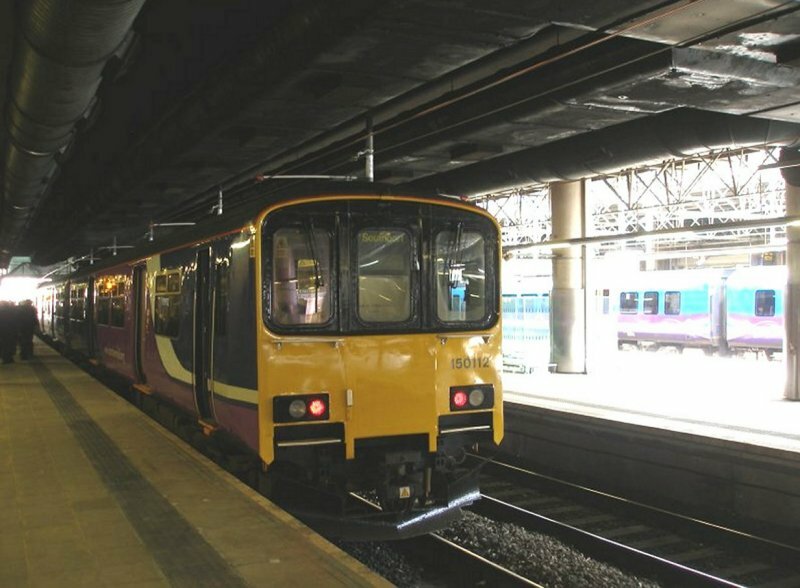 This platform - under LMS ownership - would be extended over the river and into Manchester Exchange to form the longest platform in the country. Note the overall roof that covered the through lines at this time, and the overhead parcels railway.. Copyright image reproduced with kind permission of John S Gibb. The 'Now' view was taken on Saturday 11 April 2015 on the occasion of a tour organised by the Lancashire & Yorkshire Railway Society. 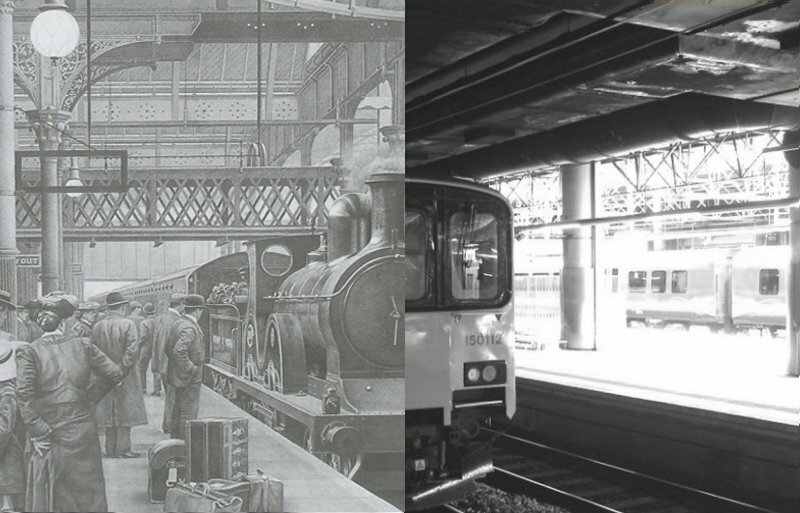 It seems unlikely - with the Arena now above the site - that the current Platform 6 has the same footprint as the old Platform 12, but the train in the background is at the same platform as the Radial in the 'Then' image. Platforms 4 & 5 now occupy the site of the old through lines. Sitting at Platform 6 is 'Sprinter' 150.112 coupled to a 'Rattler' ready for the 'off' to Southport. Where are the Coronation Scot twins now? Note that the overhead lines are now installed and awaiting the arrival of a Class 319. 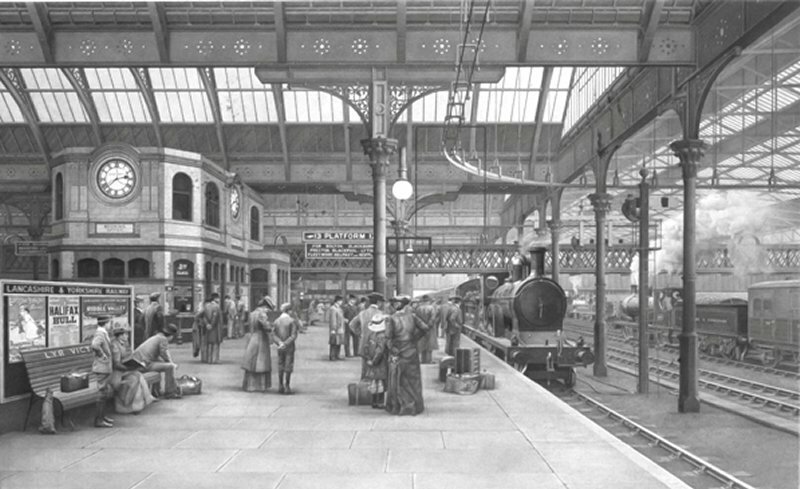 Finally, a glimpse of John's full-sized work which shows even more of the 'old' station.